Fresh off a string of frustrating games to open their season, the Mets freely admitted Wednesday that they needed -- and would stop at almost nothing to acquire -- a victory. It was with that as a backdrop that the Mets' vexing homestand melted into a satisfactory ending, with six shutout innings from Logan Verrett leading to a 2-1 win over the Marlins at Citi Field. Kevin Plawecki hit a go-ahead, two-run single in the seventh inning off Dustin McGowan, after Adam Conley matched Verrett with six zeros of his own. Only after Conley left the game did the Mets finally rally on singles from Wilmer Flores and Asdrubal Cabrera, followed by Plawecki's one-out hit. 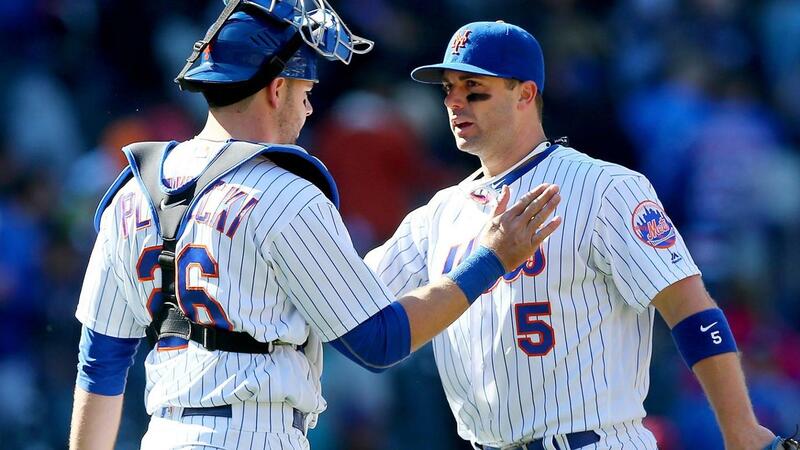 "We're just happy to come out of here with a win," Plawecki said. The Marlins fought back on a Justin Bour RBI single in the eighth, but Jeurys Familialocked down the final five outs for the save. That snapped a four-game losing streak for the Mets, preventing the Marlins from achieving a series sweep. Plawecki breaks through: The Mets entered Wednesday ranked last in the Majors in batting average, slugging and home runs, then spent the first six innings showing why. They had scored one run in their last 20 innings when Plawecki stepped to the plate in the seventh, smacking a McGowan pitch into left field for a go-ahead, two-run single. "It definitely was a good feeling," Plawecki said. "I was just trying to get a good pitch to hit. I was just trying to put something in the outfield to score the runner from third ... but I was fortunate enough for it to find a hole." Ichiro doubles, left stranded: Ichiro Suzuki, making his first start, delivered a double to lead off the fourth, putting the Marlins in business to get on the board. However, he was unable to advance, as Verrett worked out of a potential jam. The double was career hit No. 2,937 for Ichiro, who is 63 shy of 3,000. According to the Elias Sports Bureau, Ichiro (42) is the oldest player to start in center field since Rickey Henderson (43) on July 24, 2002. "Those are areas we've got to be able to execute," Mattingly said. Career-high K's for Conley: Conley established a career high with nine strikeouts, but none bigger than getting Cabrera to end the fourth. The Mets filled the bases with one out, and Conley beared down, retiring Flores on a foul pop to first base. Cabrera, who singled in his first at-bat, struck out on an 85-mph slider. The lefty ended his day by striking out Yoenis Cespedes and Neil Walker. His previous strikeout high was eight, against the Phillies in six innings Sept. 23, 2015. Henderson's struggle: Subbing for the injured Jacob deGrom, Verrett gave the Mets six much-needed shutout innings. But Mets manager Terry Collins removed Verrett after only 85 pitches, asking Jim Henderson -- a veteran of two shoulder surgeries who threw 34 pitches about 18 hours earlier -- to take the mound in the seventh. Henderson proceeded to allow a sharp single and two walks, throwing his fastball several miles per hour slower than usual. It took a combined effort from Hansel Robles and Jerry Blevins to escape the inning. A frightening moment affected the Mets in the eighth, when Cespedes launched nearly horizontally into the left-field stands in pursuit of a foul ball. Cespedes disappeared into the crowd and did not emerge for several moments, as trainers rushed out to check on him. But he remained in the game, and no fans in the area suffered injuries. Marlins: Off Thursday, the Marlins open a three-game set with the Braves at Marlins Park at 7:10 p.m. ET on Friday, which is Jackie Robinson Day across the Major Leagues. Opening Day starter Wei-Yin Chen will be on the mound 10 days after facing the Tigers on April 5. In the second inning, Chen was struck on his left elbow by a comeback liner, and being cautious, he was given extra rest. The Braves turn to right-hander Williams Perez. Mets: Following an off-day Thursday, Bartolo Colon will return to Cleveland on Friday to start against the Indians, his first big league club. He'll face right-hander Cody Anderson in a 7:10 p.m. ET game at Progressive Field, the start of a three-game series and three-city road trip that also winds through Philadelphia and Atlanta.